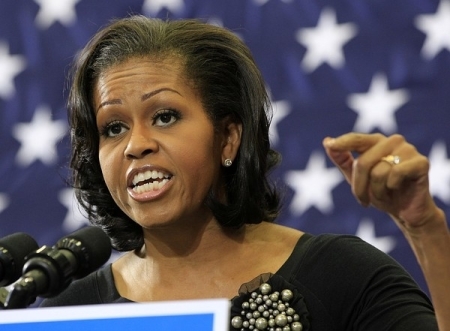 Poor Michelle Obama: White House Is Like A Prison. A lot of Americans have lost their jobs because Obama has badly mismanaged the economy. Other people are struggling to make ends meet because he’s driving up the cost of health care, energy and gas with his radical liberal policies. Tea Party groups are being persecuted by Obama’s IRS and of course, he’s gotten people killed in Benghazi and Fast and Furious. But, all of that is nothing to the suffering felt by POOR MICHELLE OBAMA. First lady Michelle Obama spoke of the power and the prestige – and prison feel – of the White House during a visit with African wives in Tanzania on Tuesday. Being first lady has “prisonlike elements,” she said, as the Weekly Standard reported. She made the comments seated next to former first lady Laura Bush. Wow, doesn’t that make your heart just bleed for her? If only the GOP had run a nominee better than Mitt Romney in 2012, we could have beaten Obama and then Michelle and her husband, the single worst President in US history, could have gotten a “pardon” from the prison they’re in.